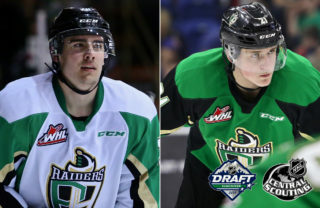 Warman, SK – The Prince Albert Raiders offence was firing on all cylinders on Saturday night in Warman. 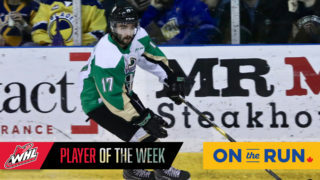 Led by Parker Kelly’s goal and two assists, the Raiders downed the Saskatoon Blades 7-5 on Saturday night at the Legends Arena. 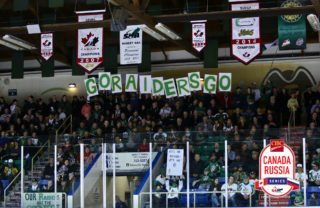 This was the Raiders’ first win in at the Legends Arena since the Blades began hosting exhibition games in Warman during the 2012 preseason. Luke Coleman opened the scoring with 13 seconds left in the first period, giving the Raiders a 1-0 lead after 20 minutes. In the second, Carson Miller increased the Raiders’ lead 1:16 into the period. 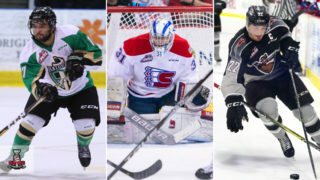 The Blades responded with two goals 2:07 apart to tie the game. Kelly got his goal at the 8:13 mark of the frame to restore the lead, but Michael Farren quickly answered for Saskatoon. The Blades took their first lead of the game in the third period when Kirby Dach broke the tie at the 2:34 mark. Less than two minutes later, Sean Montgomery found the back of the net to tie the game at 4-4. Dach then scored his second of the stanza with 10:26 to play, giving the Blades a 5-4 lead. 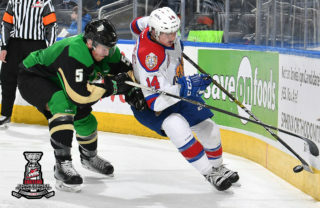 The Raiders responded with three goals in the final 10 minutes of the game to earn the win, Spencer Moe tallied his third of the preseason, picking the corner on a power play. About three minutes later, Kolten Olynek scored the eventual game-winning goal on another power play with 5:57 to play. Captain Tim Vanstone added an empty-net goal to round out the scoring. Rylan Parenteau saw his first action of the preseason for the Raiders, stopping 27 shots for the win. Brock Hamm and Joel Grzybowski combined for 27 saves in the loss. 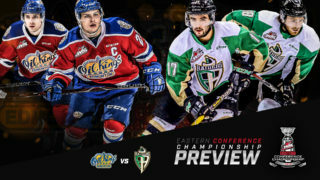 The Raiders continue their preseason schedule on Thursday night when they welcome the Moose Jaw Warriors into the Art Hauser Centre. Puck drop is 7 p.m.